Americans are more leery of Russia and cyberattacks than they were a year ago. A majority of Americans, 68 percent, consider Russia either unfriendly or an enemy of the United States, according to a new NBC News/SurveyMonkey poll. That's a 9 percent increase from one year ago, when 59 percent of Americans said they considered Russia either unfriendly or an enemy, signaling that attitudes toward Russia have worsened amid President Donald Trump's administration and the federal probe into Moscow's interference in the 2016 election. More Democrats than Republicans expressed anxieties about Russia. 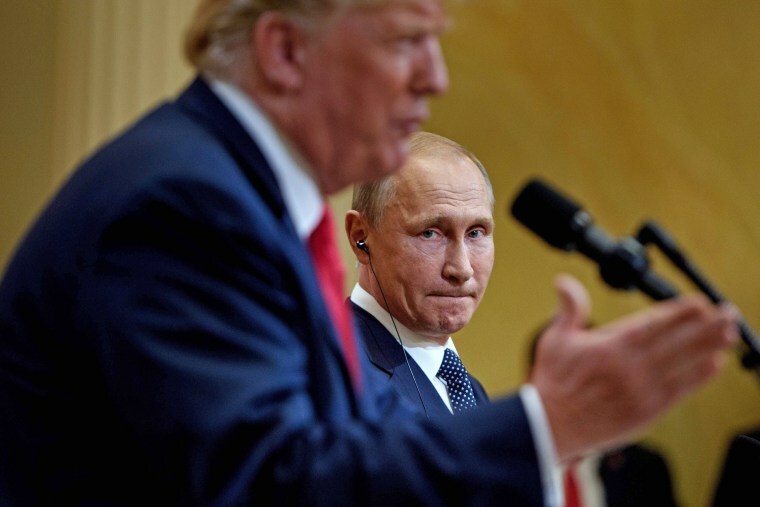 While a 47 percent plurality of Democrat sand Democratic-leaning respondents think Russia poses the greatest immediate threat to the United States, only 10 percent of Republicans and Republican-leaners said they think so. Some 81 percent of Democrats consider Russia unfriendly or an enemy, and 61 percent of Republicans and Republican-leaning respondents feel the same way. Independents were in the middle: 24 percent said Russia was the United States' greatest threat; 64 percent said they believed Russia was unfriendly or an enemy. The poll also saw a growing fear of cyberattacks, and a lessening fear of outright war: 45 percent of Americans think cyberattacks pose the greatest threat to America, up from 31 percent nine months ago. Meanwhile, 59 percent of Americans worry the U.S. will engage in a major war in the next four years, down from 72 percent nine months ago. The poll, which was conducted while the president was in Europe visiting allies but before the summit with Putin on Monday, also found that Americans are unsure that the government is protecting future elections. The survey was commissioned to coincide with the Aspen Security Forum, a gathering of top government officials, security industry experts and journalists, of which NBC News and MSNBC is the media partner. A majority of Americans, 59 percent, said they aren’t confident the government is doing enough to stop foreign countries from influencing future elections, while 37 percent say the federal government is doing enough. Trump said on Tuesday that the U.S. is doing everything it can to protect its elections from future Russian interference. "We have a lot of power," Trump added. The NBC News|SurveyMonkey poll was conducted July 9-15, 2018, among a national sample of 5,314 adults. Respondents for this nonprobability survey were selected from the nearly 3 million people who take surveys on the SurveyMonkey platform each day. Results have an error estimate of plus or minus 1.8 percentage points. For full results and methodology, click here.